Susan P. Curnan’s article on Val-Kill [“The View from Val-Kill”] in the fall 2010 issue actually brought me to tears. Curnan writes eloquently, movingly and indeed intimately about her father and Mrs. Roosevelt, and the confluence of these extraordinary influences and opportunities in her childhood. And to learn that it is Susan Curnan in that truly iconic photo of Khrushchev! I remember it well, because as children we were so afraid of Mr. Khrushchev. Truly, I thought that girl could have been me. Two summers ago I went to Val-Kill with our daughter. She, too, was inspired by Eleanor Roosevelt and wanted to see the place Mrs. Roosevelt had made and that had helped make her. Seeing it through our daughter’s eyes made the space even more meaningful. But to read of Val-Kill through Curnan’s eyes — she has given all of us the great gift of both her story and her work that grew from it. Smith is an associate professor and associate director of the Hornstein Jewish Professional Leadership Program and an affiliated faculty member in the Department of Near Eastern and Judaic Studies and the Cultural Production Program. As a former editor-in-chief (The Justice, 1967), I am writing to say thanks to our new editor, namely you. 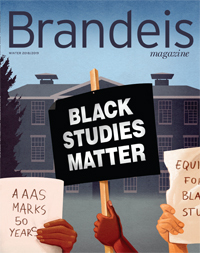 I read the fall issue of Brandeis Magazine cover to cover. It had me grumbling a couple of times. (What magazine worth its salt would not provoke a ’60s Justice editor?) It touched my heart. It held my attention and educated me. Seriously, though, thanks for restoring visual dignity to our magazine. For a time the magazine seemed to me to have grown embarrassingly commercial, even crass, resembling the noisy catalogs from discount construction-supply companies that crowd my mailbox. The new format provides a classy container for the engaging content. Gerstel writes about house design and construction and construction management. I’m delighted that the magazine has been redesigned. As a journalist and former magazine editor, I’ve been frustrated that my alma mater, with a vast supply of rich content for a magazine, published one that fell short in the quality of its design and writing. The new, more inviting and readable design better serves the university.